Ptl. Kevin Werner gave a presentation to the Law Enforcement and Public Safety Academy (LEPS) this morning. LEPS is a four-year high school program offered by the Freehold Regional High School District at the Manalapan High School for students considering a career in law enforcement. The class is instructed by Ed Wall, a retired lieutenant from the Parsippany Police Department. Ptl. 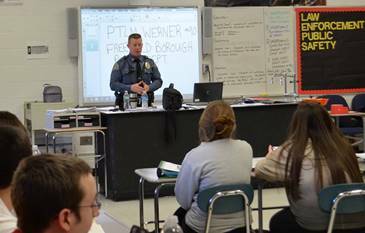 Werner spoke about law enforcement as a career and taught students about the process of entering lthe field. Ptl. Werner also serves as one of the coordinators and the PT instructor for our award winning Youth Police Academy program. The Freehold Borough Police Department has several officers available for public speaking engagements on a variety of topics. It is another way for us to maintain a strong relationship with our community.